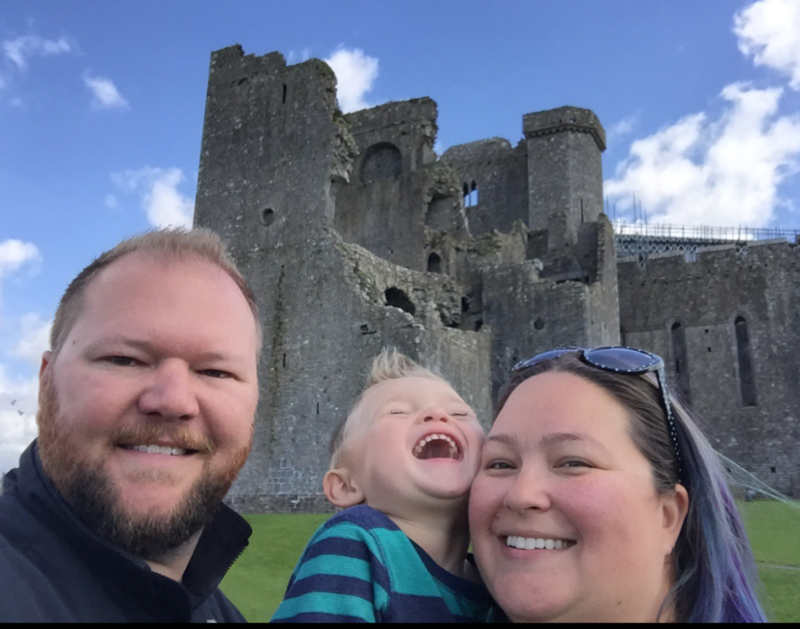 I have been getting lots of packing questions lately, so for my first Packing post I will start with Travel Tips for the littlest adventurer in our family. 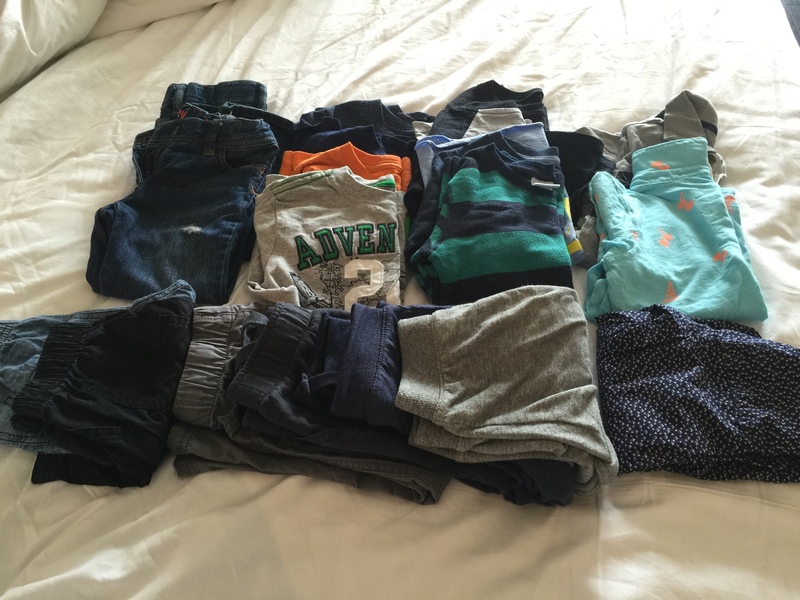 I will discuss what to pack for 18 days in Europe with a 3 year old. Packing for toddlers is tough but having a system, knowing what to bring and what not to bring can really help take the stress out of your next long trip. For starters, we never try to pack for the entire trip if its over about 8-10 days. If we will be traveling for longer we just plan on having to do laundry somehow at some point while traveling. 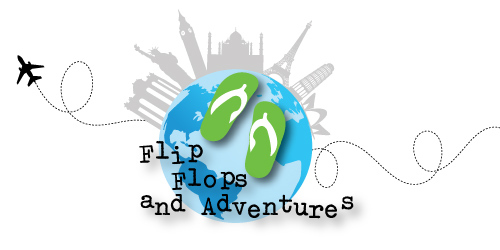 On this trip we are currently between the Cote D’ Azur in France and Milan, Italy areas for 18 days. We will definitely be changing hotels several times, so it doesnt make sense to be lugging around 16 days worth of dirty, unwearable clothes by the end of our travels. When we are moving around alot, we want to keep our luggage as manageable as possible, since it will be going on and off of trains, in and out of rental cars and hotel rooms that may or may not have a lift (elevator). 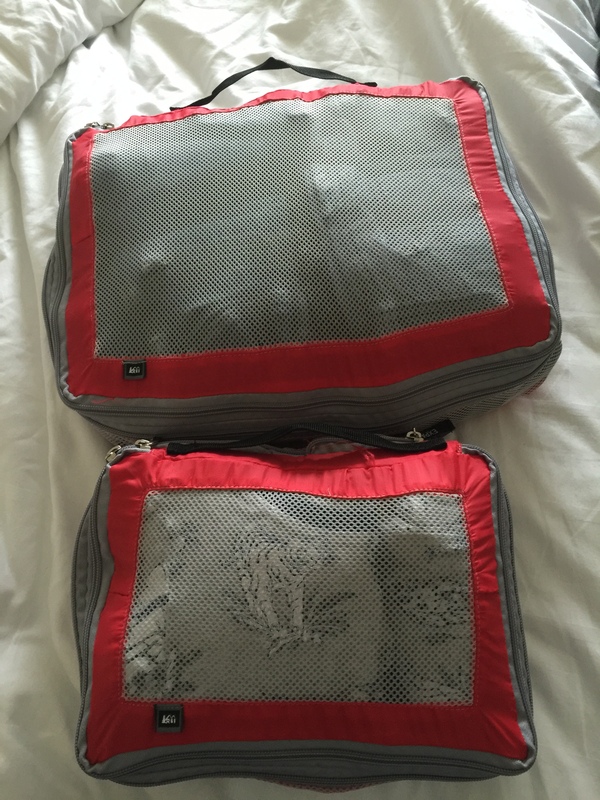 If you do not have packing cubes, I am a huge fan! The first time we packed with these was about a year or so ago. I have no idea why I waited so long to try them, but I feel like they are a total game changer! Before we had a kid, Justin and I would pack for a 16 day trip through Europe in one single carry on sized suitcase with a backpack each. 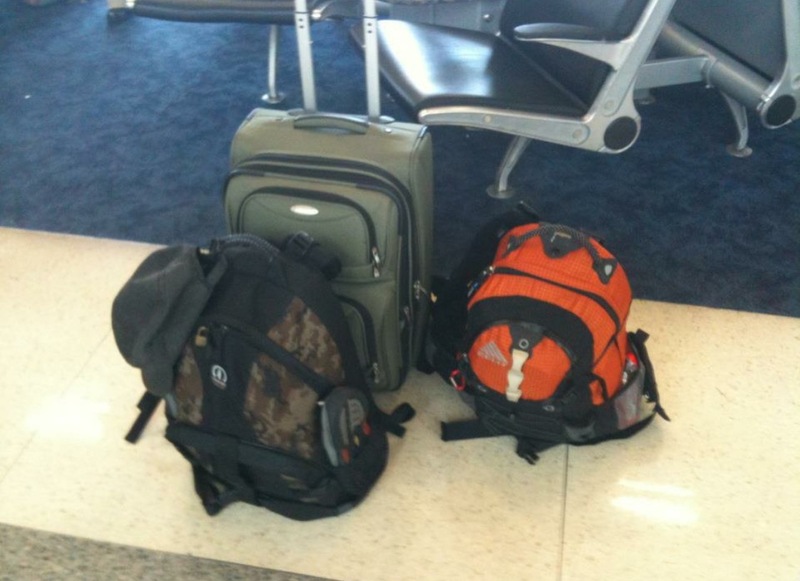 This was our luggage for 16 days in Europe, 5 countries-no problem! That meant all of our stuff would be mixed together like crazy! 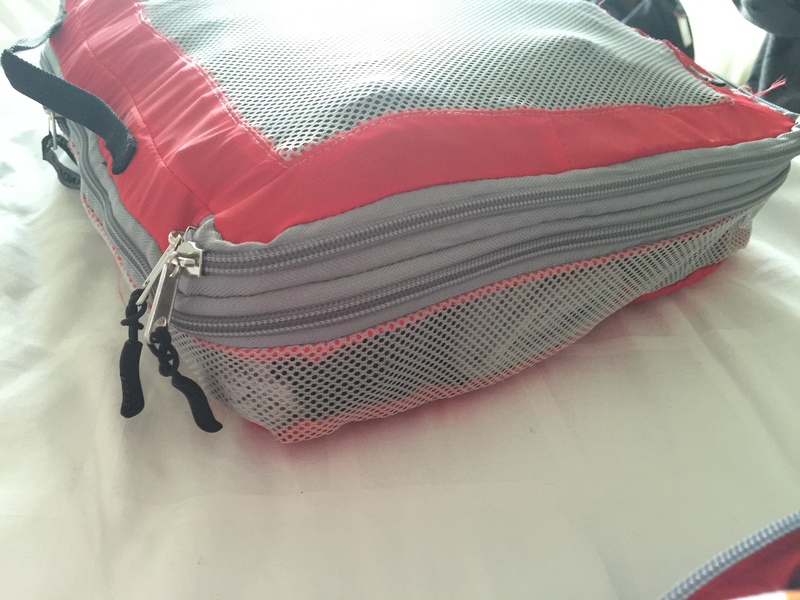 Having packing cubes could have really simplified things. 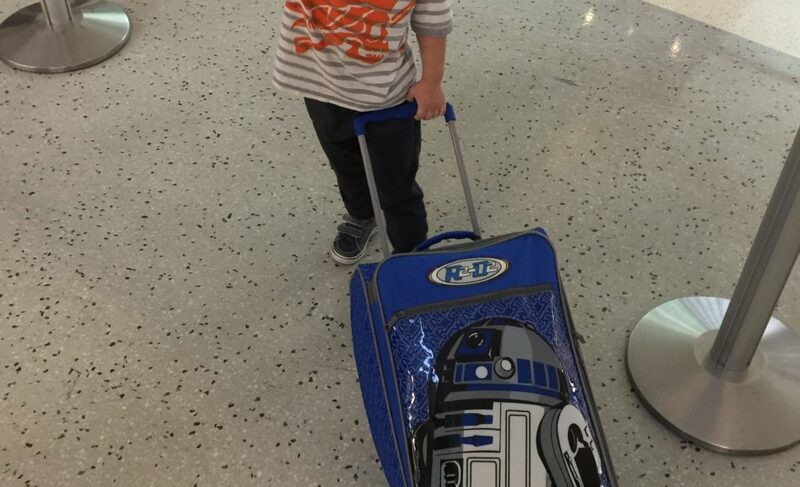 Now that many of our trips are Jameson and I tagging along on Justin’s work trips, we usually take 2 suitcases. Justin packs all of his clothes for work and holiday activities (usually dry cleaned so he keeps them neat in packing folders) in a carry on suitcase. Then Jameson and I share a normal sized checked suitcase for both of out stuff. *More on the adult packing items and accessories in a later post. Having the packing cubes while sharing a suitcase is so nice because everything that is Jameson’s fits neatly into one large and one small color coded cube. I have tried multiple styles and like this kind because of the see through, breathable mesh as well as the fact that they have double zippers that allow for compression when needed. The temperatures were going to be a wide range according to the weather forecast on this trip and because of the change in locations. 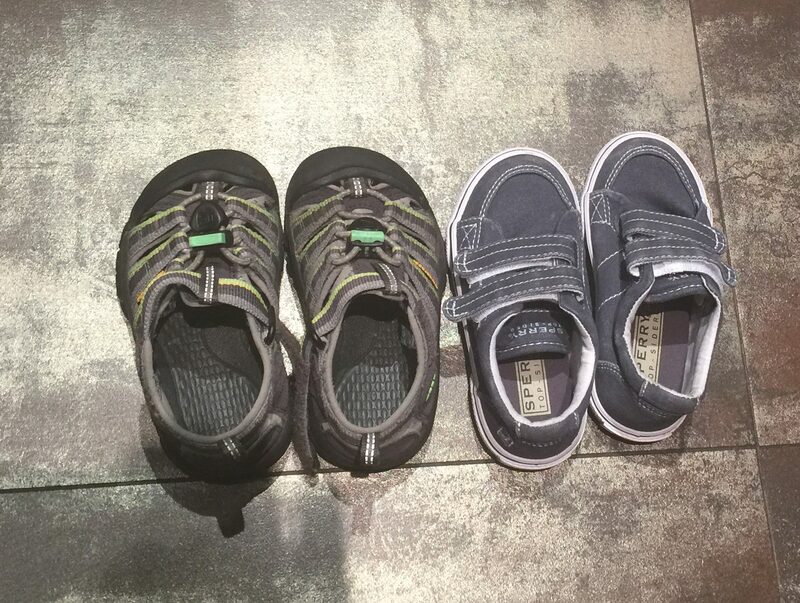 He wears one pair of sturdy walking shoes, (we are a fan of Keens) and then we pack one pair of slightly nicer but still comfy for walking shoes. I resist the urge to pack “outfits” and instead try to bring only neutral items that will work interchangeably with almost any top or bottom in the suitcase. This keeps things simple and also eliminate the potential issue of needing a certain item that somehow already got dirty or is not appropriate for the weather that day and then that item becomes useless and wasted space! As far as washing and running out of clothes questions go, we do re-wear some items as needed, like jeans or a shirt that we only wore for a couple of hours the day before. There have been many different scenarios when it comes to laundry time, some much easier or more difficult than others! 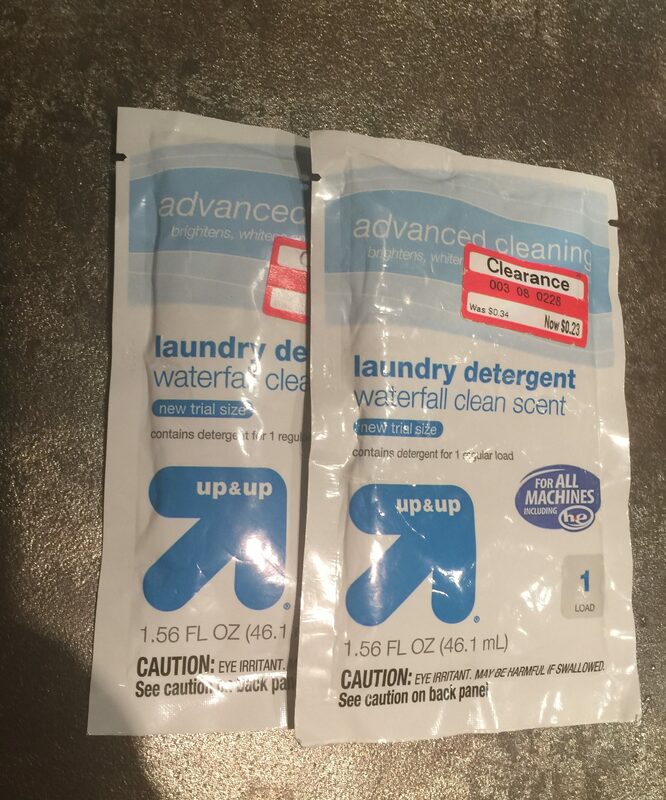 I always carry little travel sized detergent in case we get in a pinch, we can always wash a couple of pieces in the sink or bathtub until we get the laundry done. This has been necessary more than once! Once we washed a whole load of laundry by hand when we waited too long and needed clean clothes on a cruise ship. I am sure that cabin steward thought we were crazy with damp clothes hanging everywhere to dry for days! We have used Laundromats in San Gimignano and taken shifts to get laundry done at midnight after tons of walking all day in Munich. Fortunately, we have been lucky some places like the wonderful furnished Aparthotel in Brisbane with our very own washer and dryer. We stayed for a month, and Justin said it was the most excited he had ever seen me about a washing machine, haha! Just pay a laundry service, typically by weight, but sometimes by item. It’s the most efficient and simplest method. Laundry Services have been pretty easy to find the last several times we have been in Europe. You just drop your laundry off and usually the next day it is washed, dried, folded and bagged up ready for you the next afternoon. This service has typically cost about 25€ to 30€. It is well worth the money in my opinion to minimize the weight and amount of bags that you must drag around. And the cost of washing is usually less than what you would expect to spend on that extra checked bag! 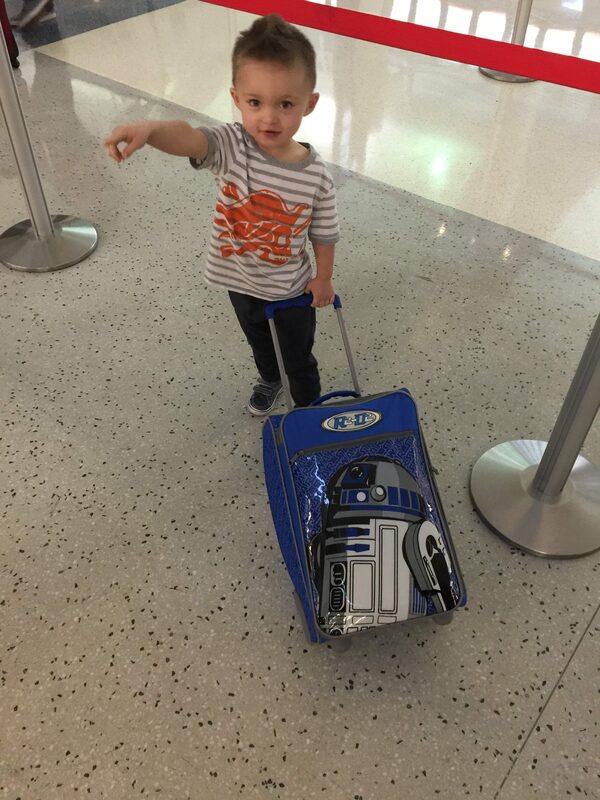 Jameson also carries his own child sized backpack which has most of his entertainment both for travel time and the duration of the trip. The majority of the stuff I put inside he has never seen before. I always browse the Dollar Spot at Target for things to hide away for next time. He also really has no idea that places like ChickFilA give away toys in their kids meals. I grab them and put them away for his backpack on trips. I love to have mostly “disposable” toys that were free or $1-$3 so that we have the option to throw them away or gift them before we return home. 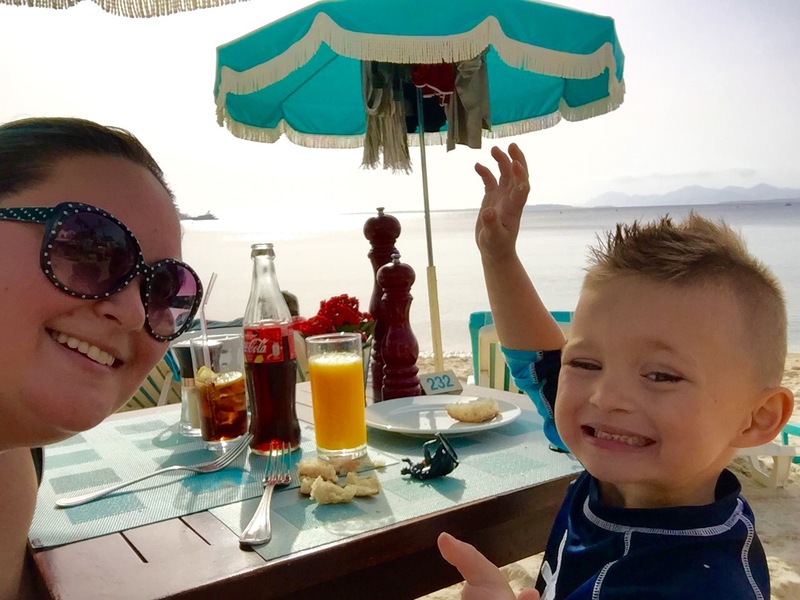 We usually also purchase a new toy and book or activity that we know he will like and will entertain him throughout the trip. Lately, our favorites have been a new RescueBot and a dry erase workbook. 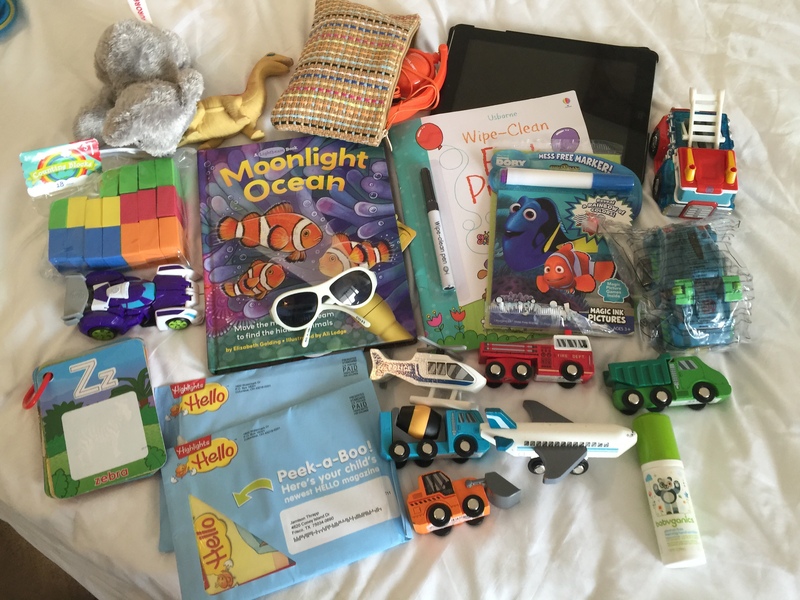 I also plan to go into detail on my fave items to entertain little ones while traveling in a post soon! That concludes my first packing post! I hope that it was helpful and interesting. I have several more planned and coming up soon. Please let me know if there is something you would like for me to cover about packing tips and tricks in a future post!